The person who owns this car must love nature. 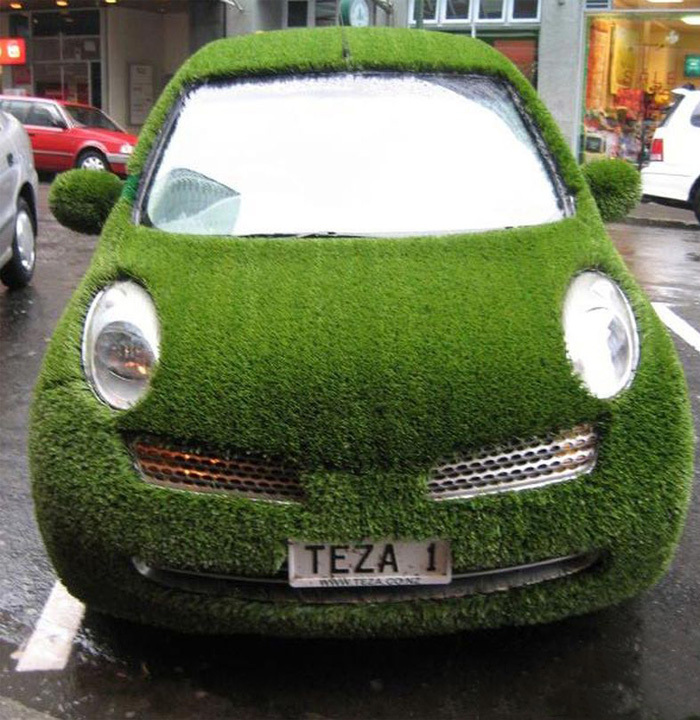 The car is covered with green astroturf to make it look like it is covered in grass. The entire car is covered except for the headlights, the brake lights, and the windows. This is a very unusual vehicle. Of the 10 most unusual cars on this list, this car is the most unique. The owner of his car wanted to create a work of art. He bought two Volkswagon Beetles and designed them to look exactly the same. After they were identical, he attached the second car upside down on top of the first car. He even added fake legs coming out of the top of the second car to make it look like the driver’s and the passenger’s legs are suspended in the air. Chances are this car is not street legal. Since the people in the second car would need to sit on the ceiling of the car, it can’t be very safe. It is a very unusual car. In this photo, you can see bystanders with chairs and umbrellas which leads you to believe that the car was in a parade. You probably won’t see this car in Monday morning rush hour traffic. This car is very interesting. The owner turned a typical vehicle into a huge work of art. 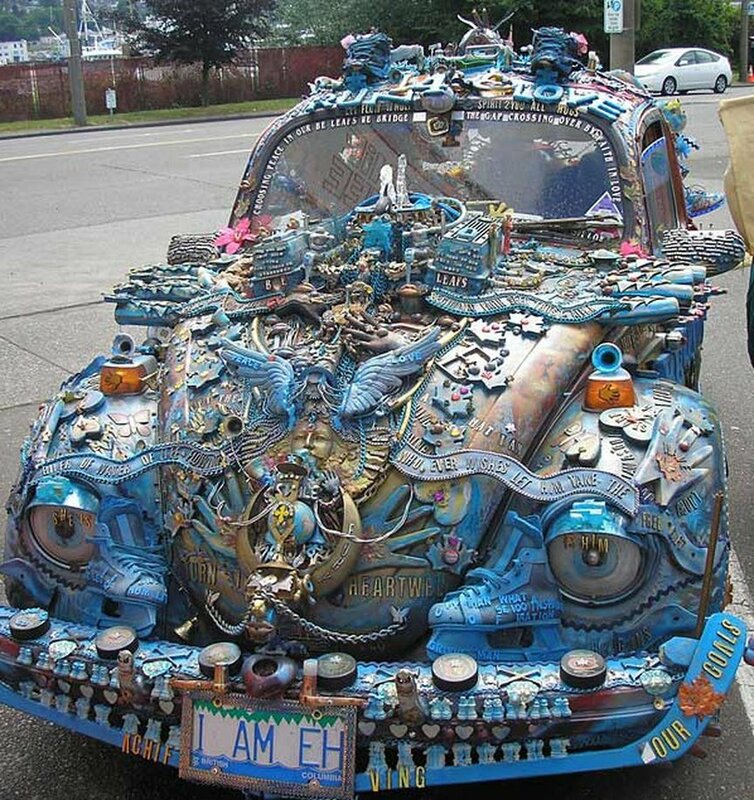 There is so much to look at on this car that it can take hours to pick out each different works of art. There is no rhyme or reason to the items or their placement on the car. According to the driver, it took years to complete this work of art. When this vehicle drives down the street, it is sure to turn a few heads. This is a combination of a car and a motorcycle and it is amazing. It has the design of a motorcycle but you steer it with an actual steering wheel. 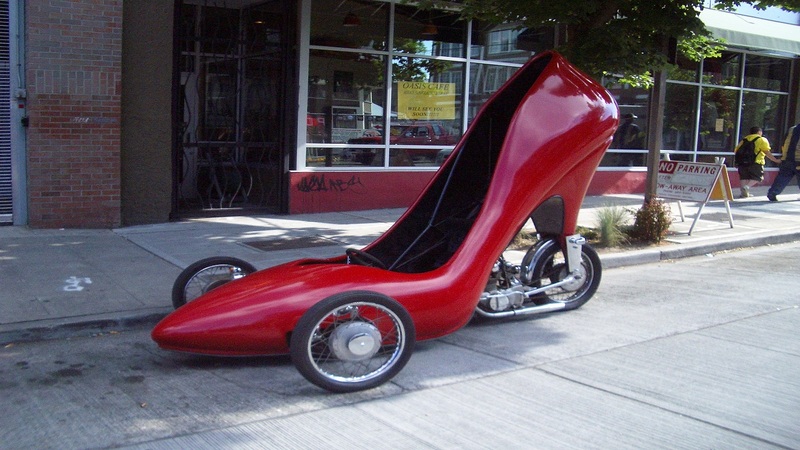 The car itself looks just like a lady’s high heel shoe. The motor is located under the arch in the foot and it rides on three wheels. The driver would sit right inside the shoe. The person who owns this vehicle says that in his eyes, it is a work of art. Since there is no roof or on this car, it needs to remain garaged if it starts raining or snowing. 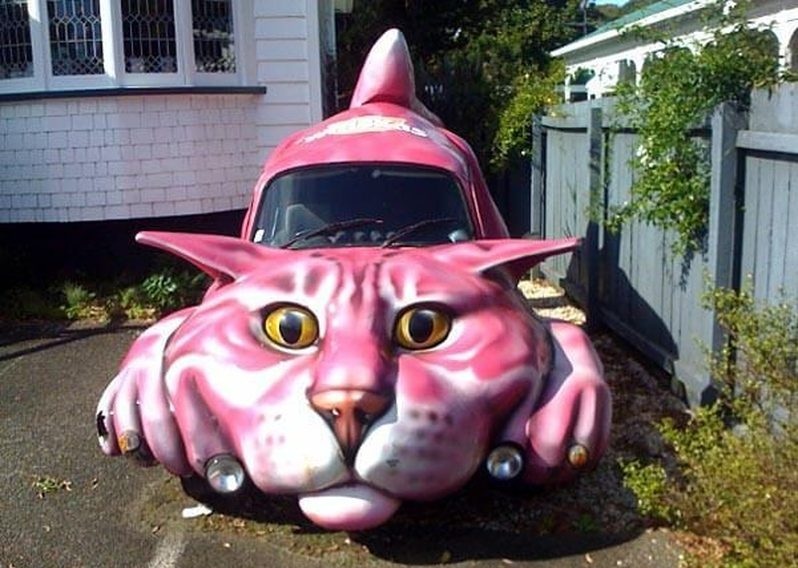 The person who created this car must really love cats. The owner took a typical car and outfitted it to look just like a cat. Not only does it have the face and the body of a cat, there are paws on the side of the vehicle. The detail in the cat is absolutely amazing. Based on the design, there is a good chance that this car is street legal. The only danger of this car is if drivers passing by stare at the car and forget to keep their eyes on the road. Most people look at a Jaguar and they appreciate how sleek and gorgeous it looks. This Jaguar is the exception to the rule. 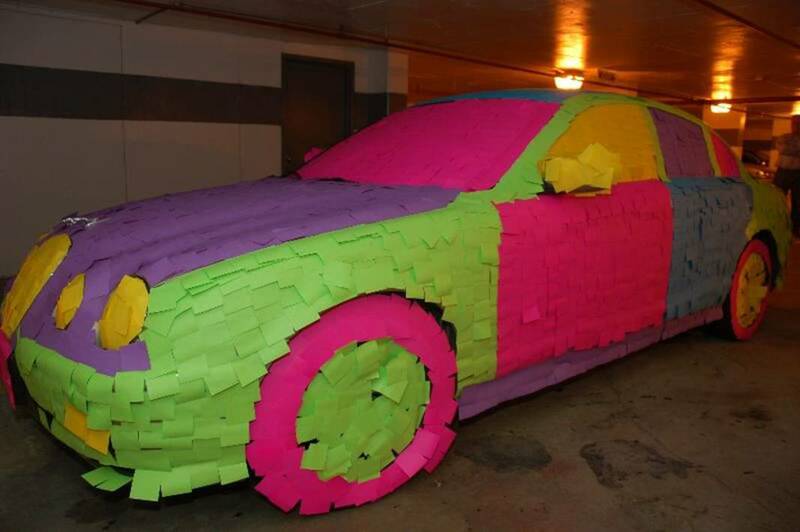 The owner of this car covered the entire car with post-it notes. Ever area of the car is covered, including the windows and the windshield. Based on this, the owner of the car cannot even drive it because they won’t be able to see outside. The color scheme was carefully planned out. If this car were to be moved, the post-its would likely fly right off the car considering that post-its use just a thin layer of adhesive to stick. 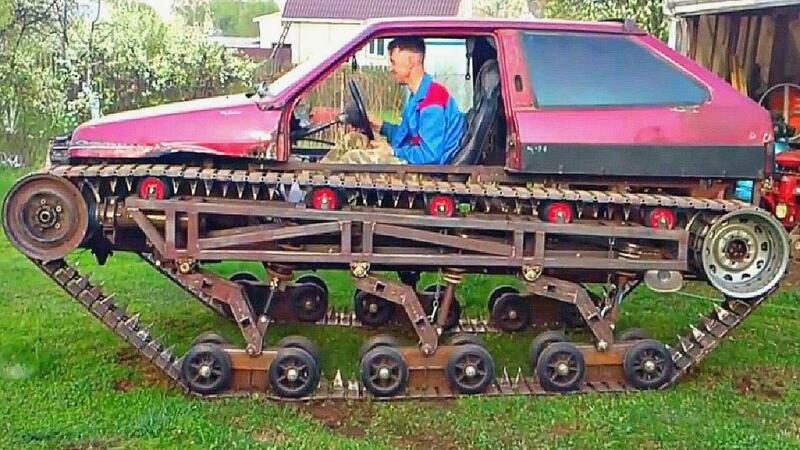 This is one of the most unusual cars in the world. It is a station wagon and the owner had it wrapped on leopard print paper. 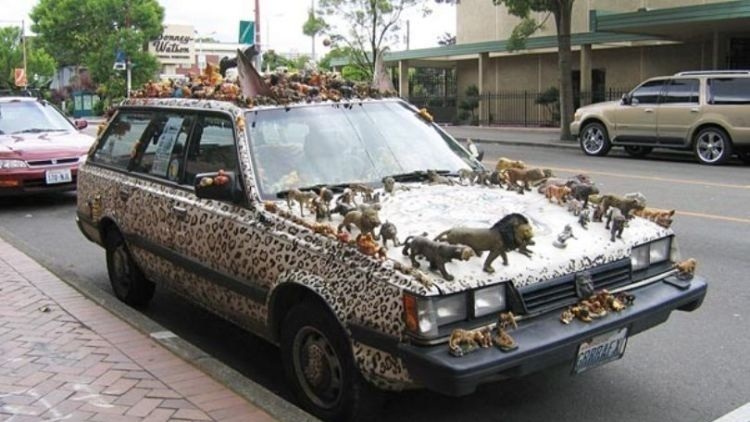 Next, they affixed hundreds of plastic zoo animals to the car. There are lions, tigers, elephants, rhinos, and various other animals that you would find in a zoo. Since the car is parked right on a city street, it is obviously street legal. There is a good chance that this vehicle turns a lot of heads every time it drives down the street. This van is amazing and it must have cost a lot of money to create. 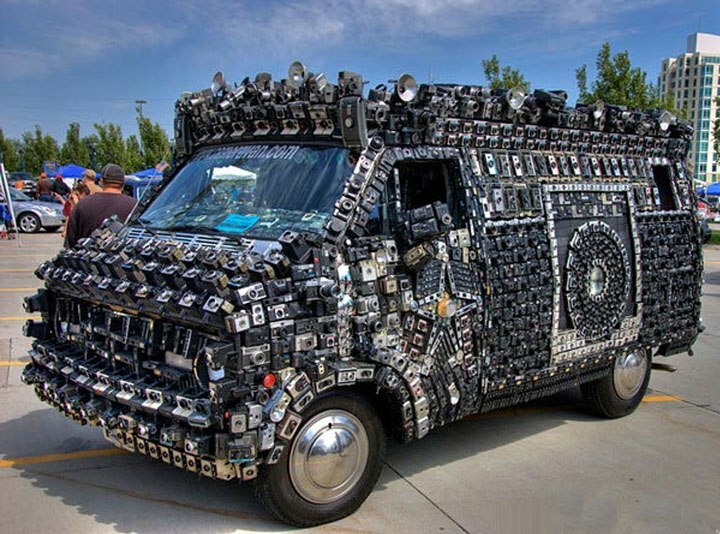 It was originally a typical van, however, after the owner affixed thousands and thousands of different types of cameras on the van, they created an amazing work of art. Whether or not the cameras are in working condition is unknown, however, if the owner of the van takes it out when it rains or snows, if the cameras did work, they don’t anymore. 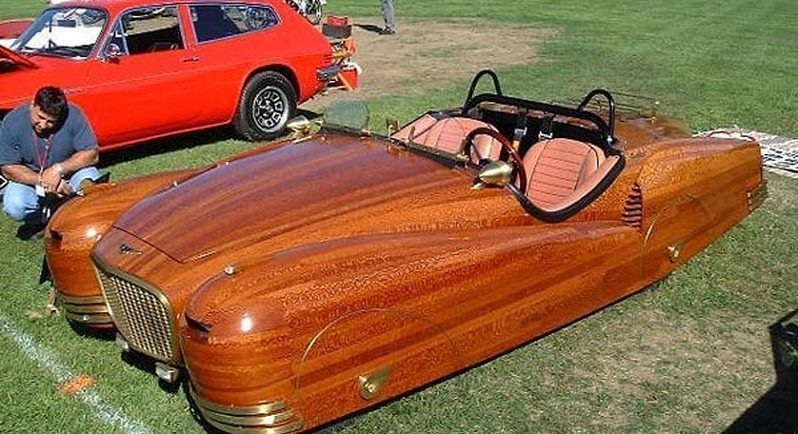 This car is pretty amazing because it looks as though it was carved out of wood. It is a low rider and even the tires are covered with the wood shell of the car. Based on the size and design of this vehicle, there is a good chance that it not the owner’s main source of transportation. According to the owner, his wooden car often takes first place in local car shows. 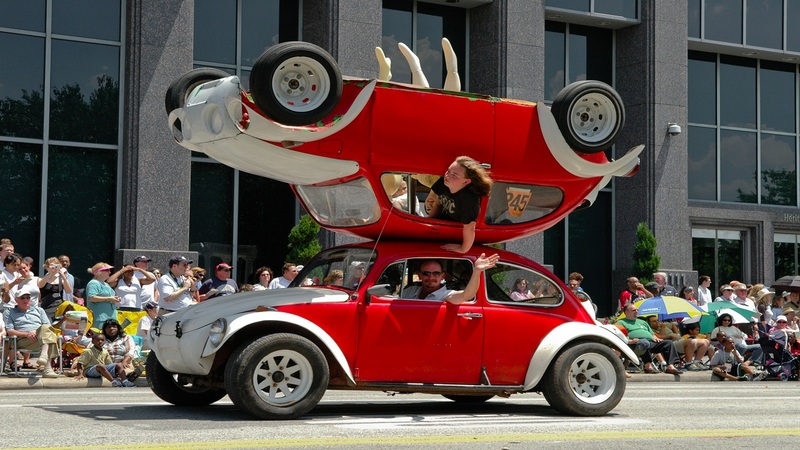 This car is a typical Volkswagon Beetle with a twist. The owner of the car designed it to look like a mouse. 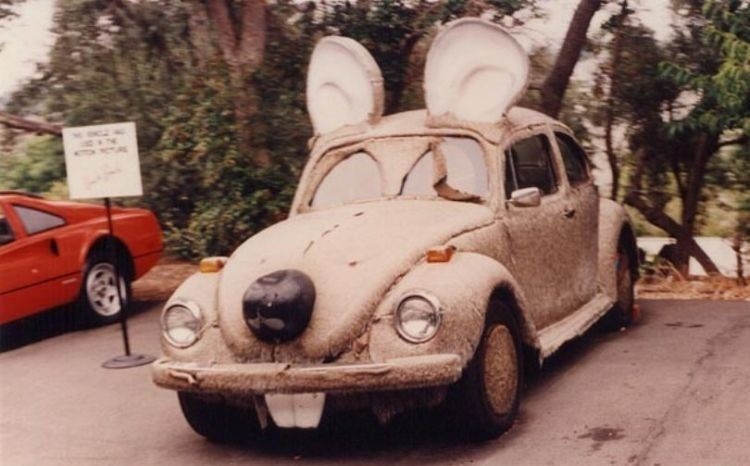 The car has mouse ears, a nose, and buckteeth. It is also covered with a layer of fur. It would be very funny if the cat car listed above chased the mouse car down the street. The owner of this car used the machinery of a tank for the car’s moving parts and he placed the top half of a car on the moving parts. This is where the driver sits, steers, and controls the gas and the brake. The owner says that it took him years to complete the car. He said that finding the moving parts of a tank was a project in itself. FactsVerse participates in the Amazon Services LLC Associates Program, an affiliate advertising program designed to provide a means for sites to earn advertising fees by advertising and linking to amazon.com. As an Amazon Associate we earn from qualifying purchases.